Coventry & Warwickshire is a major centre of advanced manufacturing, including automotive, rail, aerospace and motorsport, employing in excess of 40,000. It is located at the heart of the Midlands automotive and aerospace cluster. The area is particularly strong in R&D activity, in low carbon electric and hybrid powertrain technology, light-weighting, CAV (Connected & Autonomous Vehicles) and software. These activities are driven forward by investment from local aerospace and automotive manufacturers, leading university research, a unique cluster of skills and access to cutting edge innovation and technology. The UK aerospace industry is a phenomenal success story and a sector that offers tremendous opportunities for growth. The UK has a 17% global market share in aerospace industry revenues, making it the largest in Europe and second only to the US worldwide. Aerospace businesses based in Coventry and Warwickshire play a major part in the industry’s global supply chain. They are supported by world class innovation and R&D facilities such as The Manufacturing Technology Centre (MTC) and by the area’s two excellent universities. The area is also home to the Midlands Aerospace Alliance (MAA), which is the largest aerospace cluster in Europe. Locally, a number of aerospace organisations work together collaboratively through the Coventry & Warwickshire Aerospace Forum (CWAF) to develop opportunities and open up new markets. Local aerospace companies include Rolls Royce, Meggitt, Arrowsmith Engineering, JJ Churchill and Lisi Aerospace. Coventry & Warwickshire is located at the heart of the Midlands automotive cluster, the main UK auto cluster. Tracing its origins back to the arrival of the car in Europe over 120 years ago, the area is home to 35 automotive and off-highway brands, including 12 vehicle manufacturing sites, and 15 R&D centres, maintaining and developing a unique mix of skills and supply chain in automotive design and engineering. The area is particularly strong in R&D activity, in low carbon electric and hybrid powertrain technology, light-weighting and CAV (Connected & Autonomous Vehicles). These activities are driven forward by investment from local car makers, leading university research, a unique cluster of skills and access to cutting edge innovation and technology. It is internationally recognised as a major automotive design and engineering centre, and is a key supplier of vehicle components and home to the global headquarters of Jaguar Land Rover and the Jaguar Land Rover Engineering Centre. More recently, the area has become a leader in the development, understanding and deployment of electric vehicles and intelligent mobility. We are proud to have world-renowned companies such as Tata Motors, Aston Martin, Dennis Eagle, London Taxi Company, Detroit Electric, BMW, Peugeot Citroën, Geely and Volvo in the region, along with being at the heart of the automotive supply chain, with Brose, Bosch, Kautex-Unipart Limited, Eberspacher - Coventry, Lear and Delphi Lockheed in the area. With growing urban populations and clean air and water becoming an ever more important, Coventry & Warwickshire is at the forefront of developing these clean air technologies of the future. The area is a centre of energy head-quarter activity. It is also a leading centre of university and private sector R&D activity, from low carbon electric and hybrid powertrain technology, light-weighting, energy storage and sustainable building technologies. Leading local names include National Grid, E.on, Calor Gas, Severn Trent Water, Baxi, GE Power Conversion and First Utility. They benefit from the central UK location, access to a wide range of skills and two leading research universities in the University of Warwick and Coventry University. The excellent road and rail links here support access to Kingsbury Fuel Depot, the largest inland fuel storage depot in the UK. Coventry & Warwickshire is home to a number of emerging centres of excellence: The National Low Carbon Centre at Stoneleigh Park, a unique game-changer in the low carbon and clean tech market; the National Automotive Innovation Campus (NAIC) and the Advanced Propulsion Centre, both located at The University of Warwick. Coventry & Warwickshire is the centre for low carbon powertrain in the UK. 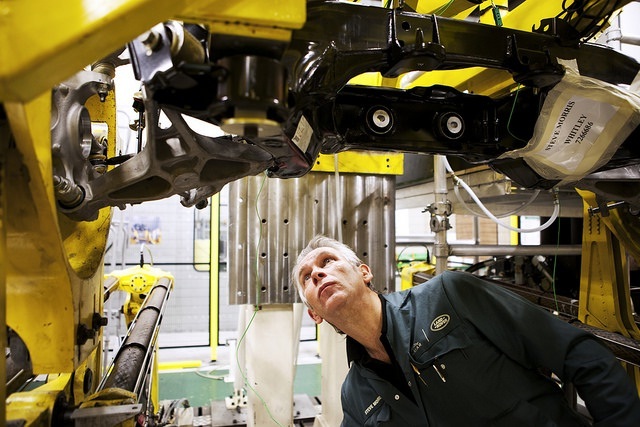 The sub-region hosts multiple R&D sites for Jaguar Land Rover, including the Whitley HQ, with new state of the art powertrain development facilities. Together with Aston Martin, Geely, BMW and Dennis Eagle, the local auto cluster nurtures a strong and growing supply chain of powertrain design and engineering services companies. The local universities host leading research into light weighting, battery storage and CAV: WMG at the University of Warwick is a UK Catapult Centre and is soon to open NAIC, the National Automotive Innovation Campus, a £150m centre for future vehicle technologies; and Coventry University, with its new Centre for Mobility and Transport works closely with Horiba MIRA and is developing its own hydrogen based vehicle Microcab. Recent investments locally have included Geely London Taxi’s £300m investment into a new manufacturing and engineering centre to build a new range of zero emissions vehicles at Ansty; Lightning Hybrids MIRA facility, Detroit Electric’s new assembly site in Leamington Spa and BMW’s £750m UK investment, including at its Hams Hall powertrain facility, which supplies plants in the UK and overseas. BMW produces thousands of engines every year at Hams Hall, including the hybrid engine for the i8 supercar. The National Advanced Propulsion Centre, at the University of Warwick is a leader in low carbon technologies, and centre-piece of a UK government £1bn Advanced Propulsion Programme, which funds collaboration in low carbon propulsion technologies. The car and city of the future are here today in Coventry & Warwickshire. Intelligent Mobility is the optimised movement of people and goods from point to point and is a growing part of the global economy. By 2025 it will be worth £900bn. It includes connected and autonomous vehicles (CAV) and intelligent transport infrastructure. Nowhere else in the UK has the combination of technological creativity, the concentration of OEM automotive R&D and levels of investment in automotive as C&W. It is the home of Horiba MIRA, a leader in CAV technology which is developing a 2m sqft R&D Campus just outside Nuneaton. Driverless vehicles of tomorrow are on test in Coventry Warwickshire today, with the Coventry built Lutz Pathfinder by RDM Group on test here and Milton Keynes, as well as mass produced vehicles from Ford and JLR. UK Autodrive is a £19.3m, 3 year project which brings together 12 private, local authority and university partners to deliver a programme of feasibility studies and practical demonstrations in Milton Keynes and Coventry, where the city councils are taking the lead in developing the urban infrastructure technologies required to support driverless mobility. UK Connected Intelligent Transport Environment (UK CITE) - £7.1m project will enable automotive, infrastructure and service companies to trial connected vehicle technology, infrastructure and services in real-life conditions over the next two-and-a-half years on roads in Coventry and Warwickshire. C&W is home to the UK’s most significant cluster of transport focused R&D activity, including Jaguar Land Rover, Aston Martin, MIRA Technology Park, Unipart, Ricardo, the Quinton Rail Technology Centre and Warwick Manufacturing Group (WMG). The area includes an unrivalled clustering of advanced engineering consultancies, prototype specialists and contract manufacturers. Many companies in the auto and aero supply chains also supply into the rail sector. Much of the local university research into light-weighting and battery storage have applications into rail technology as well as automotive. WMG at the University of Warwick is developing a Centre for Light and Very Light Rail, to apply these technologies to mass transit systems. Viva Rail, based at the Quinton Rail Technology Centre at Long Marston, near Stratford-upon-Avon, has developed the D-Train, a low cost light rail solution to replace aging rolling stock across the UK. The train will be on test between Coventry and Nuneaton, with funding from the Coventry & Warwickshire Local Enterprise Partnership. Coventry and Warwickshire is thriving in the Business, Professional and Financial Services sector. It boasts a strong and emerging workforce which has been supported by our world renowned universities and higher education institutes. We are currently home to 12,000 companies, employing in excess of 80,000 people within this sector. Future industry growth will be stimulated by the £59million professional services development at Friargate in Coventry, which will create a professional quarter in the city centre, next to Coventry’s Railway Station. Targeted at the financial and professional services sector, this development will house in excess of 10,000 jobs and act as an investment catalyst for the industry. It will provide competitive and high quality office accommodation in a prime city centre location. Coventry and Warwickshire hosts a vibrant digital and creative sector with leading names in software development, gaming, film-making, theatre, industrial design and digital infrastructure. Technology and the innovative development of how we use technology in business every day is changing at a rapid rate. Across Coventry and Warwickshire we have a host of organisations leading the cutting edge development of these technologies and how they can be integrated in to everyday life. From cyber security to video games the region is building a significant reputation in tech. With an exceptional talent pool of skilled employees and dedicated R&D facilities the region is set to continue to flourish. The games development industry alone is worth £1bn to the UK economy and employs some of the UK’s most creative minds in producing a range of console and mobile platform games. For over three decades Coventry and Warwickshire has enjoyed a rich, although sometimes well-hidden, history of world-leading videogame development and can boast one of the largest and strongest clusters in the UK. Coventry & Warwickshire is home to the globally significant gaming cluster dubbed ‘Silicon Spa’. The cluster is anchored in the heart of Royal Leamington Spa a vibrant regency town and stretches out to the surrounding areas of Southam and Warwick. Although the area known as Silicon Spa is based around the cluster of video games developers, Coventry and Warwickshire also hold a strong position within the serious games and virtual reality sector. The application of serious games impacts on several business sectors such as education, retail, marketing, advertisements and healthcare. To succeed in the digital games market, companies are realising they need to be more than just a developer who can build a good game. They also require experienced content developers, with tested design and interaction skills, as well as strong partnerships across traditional and new media sectors. The UK, home to all the world’s largest media platform and content businesses, is uniquely positioned to take the lead in this area.